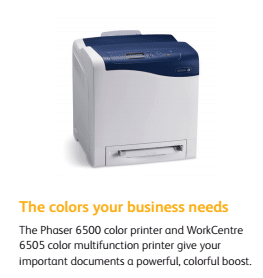 The Xerox WorkCentre 6505 Color Multifunction Printer is a printer built to take on the color printing needs your business demands. It was built with today’s business demands in mind, and offers a combination of outstanding reliability, brilliant print quality, and unparalleled simplicity. The WorkCentre 6505 will make your prints pop like never before. The WorkCentre 6505 offers a print resolution of up to 600 x 600 x 4 dpi that will grab the attention of anyone who sees them. It uses Xerox-exclusive EA Toner that uses special particles engineered for precision printing that will all your lines clear and distinctive. You can also be sure that your colors will look as bright as they should because the Xerox WorkCentre 6505 comes with True Adobe Postscript 3 to make your colors and true as they can be. You can get work started quickly with a first page out time in as little as 12 seconds. Color as well as black and white prints will come at a rate of up to 24 ppm. You will also be able to use a wide variety of media, ranging from 5.5” x 5.5” up to 8.5” x 14”. This combination of speed, versatility, and color tone offer you a number of ways to impress your colleagues. There is also an intuitive front panel to help configure device settings and program features. You also have connectivity to your computer so you can manage jobs right from your desktop. The Xerox WorkCentre 6505 Color Multifunction Printer gives you the ability to accomplish a number of impressive print jobs. If you think that the WorkCentre 6505 is right for you, then please call Spokane Copier today. We offer leases at great prices and can help you get the printer that’s right for you.